Definition: In business parlance, competitive intelligence can be understood as the process of identifying, gathering, evaluating and disseminating, information concerning competitor’s strengths and weaknesses, products, and customers, which a firm requires for strategic decision making. In other words, it is a legal and ethical practice that helps in improving the firm’s competitive ability and capacity. Competitive intelligence or otherwise called as early signal analysis encompasses information relating to competitor’s plans, products, next moves, and actions. Such intelligence influences the organization’s own plans and strategies. Add to that, it helps in prior ascertainment of opportunities and threats in the marketplace, before they are apparent. To provide an advanced warning of risks and opportunities, such as mergers, takeovers, alliances, new products and services. To make sure that strategic planning decision, relies on relevant and up-to-date competitive intelligence. To ensure that organization is able to adapt and respond to the changing business environment. To provide periodic and systematic audit of firm’s competitiveness, which provides an unbiased evaluation of firm’s actual position, with respect to the environment. Competitive Intelligence intends to make the firm more competitive with respect to the environment in which the firm operates, i.e. competitors, customers, distributors, and other stakeholders. 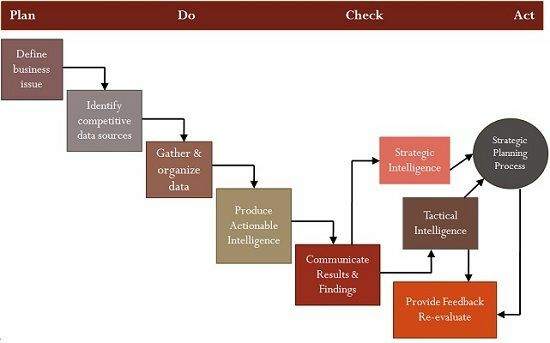 The competitive intelligence process helps the firm to obtain, process, analyze, spread and interpret competitor’s information vigorously and systematically, in order to react appropriately. Each and every decision made by the organization is based on certain assumptions, competitive intelligence proves helpful in testing and validating those assumptions. Indeed, those areas that remain uncovered by the organization’s assumptions are also considered by it. Competitive intelligence is of great help in crafting strategies for competing with other firms, by developing an understanding of the industry and the competitors as well. It is beneficial in identifying the strengths, weakness, opportunities, and threats. By engaging in competitive intelligence, the firm can successfully become the market leader and find best practices to do business.